A few years ago, I reviewed SAFE FROM THE SEA by Peter Geye and was extremely impressed with the novel, especially Mr. Geye's prose. The book received a lot of great press and Mr Geye established himself as a serious writer. Needless to say, I was looking forward to reading more of his novels and I was excited to discover that his latest book THE LIGHTHOUSE ROAD is now available. It didn't come as any surprise to me that critics are once again raving about about Mr. Geye's writing. THE LIGHTHOUSE ROAD begins in Minnesota in the late 1890s when a young woman who has immigrated from Norway finds that she's basically all alone and pregnant. The novel then moves ahead about twenty years or so, when this woman's son Odd is now an adult and trying to create his own way in life. He falls for an older woman, one with a complicated past; and Odd decides that it's best if they can escape this small town. He builds a boat and they set out on a difficult journey to begin their new lives. Unfortunately, that's easier said than done; and Odd discovers this the hard way. So I take full blame for reading THE LIGHTHOUSE ROAD in a less than ideal place; however, I still managed to appreciate this novel. Once again, I was blown away by Mr. Geye's writing ability -- he truly is a gifted storyteller! And while I'm not sure I enjoyed this novel quite as much as SAFE FROM THE SEA, I still recognize a beautiful novel when I read one. Mr. Geye's managed to create extremely authentic characters; and his incredible descriptions of the barren Minnesota landscape and the dangers of the lake water managed to make this book very special. What's difficult for me to articulate is just how powerful this novel actually is. The book begins with Odd's mother's story, and then alternates with Odd's story. Both stories are most definitely sad ones, and my heart broke for both of these characters. I couldn't imagine how terrifying it must have been to be a young woman at the mercy of so many men. And then to make things even worse, she couldn't speak any language but her native Norwegian. Her life was not an easy one and she must have been so scared and lonely. But then Odd's story was also a difficult one. His childhood is far from easy. Then, he falls for the wrong woman and sacrifices everything to give her a fresh start. I don't want to give too much away, but what Odd had to go through in his young life was so painful; and it made me want to cry for him. I think what I most appreciated about THE LIGHTHOUSE ROAD was how it delved into so many universal truths about human nature. Each character is this novel was obviously struggling, but they were also trying to discover who they really were, especially Odd. I think that's one of the main reasons that THE LIGHTHOUSE ROAD would make such a good book club selection. In addition to the characters' quests for self-discovery, the novel also explores love, loss, friendship, communication, and sacrifice. There is a reading guide available with twelve interesting questions that would definitely help generate discussion. However, I also think many intuitive readers will want to talk about the many symbols and metaphors that appear in the story. 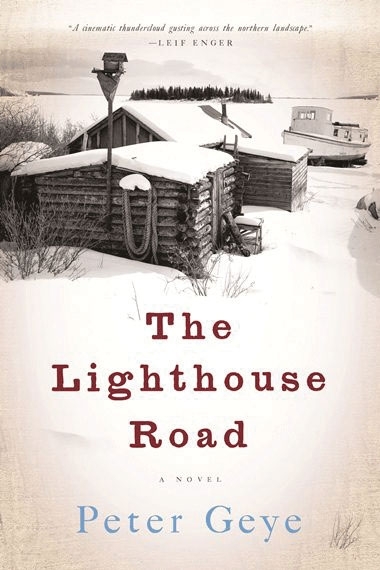 Overall, I think THE LIGHTHOUSE ROAD is another stellar novel by Mr. Geye. I definitely recommend it to fans of literary fiction and especially readers who enjoy being taken to another place and time. I keep reading about Geye's beautiful writing and need to find the time to try one of his books. They both sound gorgeous. I am really looking forward to this one. I have it on deck to read next month. Now that I've posted my review I can come back to yours. You really hit this -- it is powerful. It's really about .... well, life, isn't it?